1. Bandicam now supports a real-time drawing function while recording the computer screen. 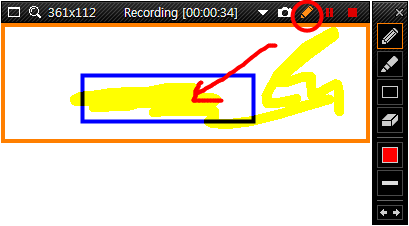 - Users can simultaneously draw lines, boxes, or highlights while recording in the 'Rectangle on a screen' mode. 2. Added a Size Preset function which allows the user to save the current target position and size in the 'Rectangle on a screen' mode. 3. The recording target will be locked when the repeat image capture function is used. - FPS information of Some MP4 files was displayed incorrectly in the Output tab. - Keyframe interval settings didn't work properly while using the MPEG-4 video codec.